It’d be hard to miss the fact that the Christmas season is upon us. It’s everywhere we look: the stores are decorated, Christmas music has started on the radio, there are even channels devoted to Christmas movies already. It’s a wonderful time of year. But for some people, Christmas can be hard. We have people from all walks of life who join us at CPO and several years ago we noticed that some of the girls who come to us need a little help making Christmas bright. So we started our Adopt-A-Girl initiative. 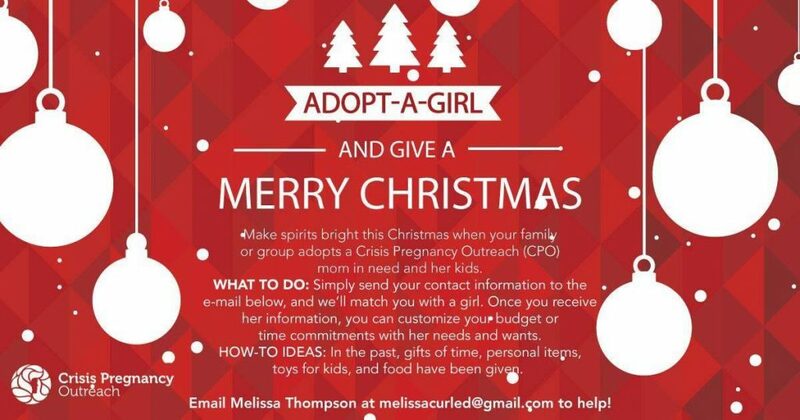 Adopt-A-Girl is an opportunity for you (or a group of you and your friends) to adopt a CPO girl for the holidays. We’ll give you a list of what she likes, or what her children have asked for, and you get to dawn your proverbial red hat and step into the roll of Santa. It’s truly rewarding. A few years ago when my wife and I were volunteering at the Transition House, we saw the young women light up when they received presents from complete strangers who just wanted to help share the love of Christ. It was amazing and something that I know touched each and every one of those girls. There are always those in need which is why we ask for your help. To adopt a girl, contact Melissa Thompson at melissacurled@gmail.com.